Confederate States of America. Surgeon-General's Office Standard Supply Table of the Indigenous Remedies for Field Service and the Sick in General Hospitals. 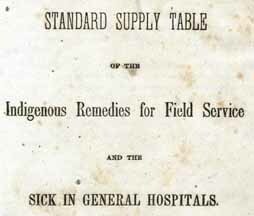 Standard Supply Table of the Indigenous Remedies for Field Service and the Sick in General Hospitals. Confederate States of America. Army. -- Medical care. Confederate States of America. Army. -- Supplies and stores. Hospitals -- Confederate States of America. Medicine, Military -- Confederate States of America.